A new, autosomal recessive type of Ehlers-Danlos syndrome has been discovered; it is very rare, so far found in only four individuals from three unrelated families. Exome sequencing (which looks at a subset of DNA—the genes that are responsible for proteins—and describes how those genes are assembled) revealed unusual variations in the AEBP1 gene. These newly-found variants of AEBP1 result in a set of symptoms that relate to those found in other EDS: joint laxity, redundant and hyperextensible skin, poor wound healing with abnormal scarring, osteoporosis, and other features. Skin biopsies revealed reduced dermal collagen and collagen fibers that looked ragged. AEBP1 is the genetic code for building a protein which associates with the collagen found between cells, in the extracellular matrix that provides support and structure for cells. The protein built by AEPB1 is called ACLP (aortic carboxypeptidase-like protein) and it has roles in development, tissue repair, and the way connective tissue scars after healing. ACLP is found in bone, the vascular system, and skin tissues; it is involved in tissue repair by affecting how fibroblast cells congregate in damaged tissue in order to produce the materials needed for healing, and the way in which connective tissue stem cells turn into collagen-producing cells. ACLP influences how molecules chain together to form collagen fibers, and binds to several types of collagen through a set of molecular receptors that are used to communicate between cells and tissue. The AEBP1 variants discovered are compound (c.1470delC [p.Asn490_Met495delins(40)] and c.1743C>A [p.Cys581∗]) in the first individual; an homozygous variant (c.1320_1326del [p.Arg440Serfs∗3]) in the second individual; and an homozygous splice site variant (c.1630+1G>A) in two siblings from the third family. 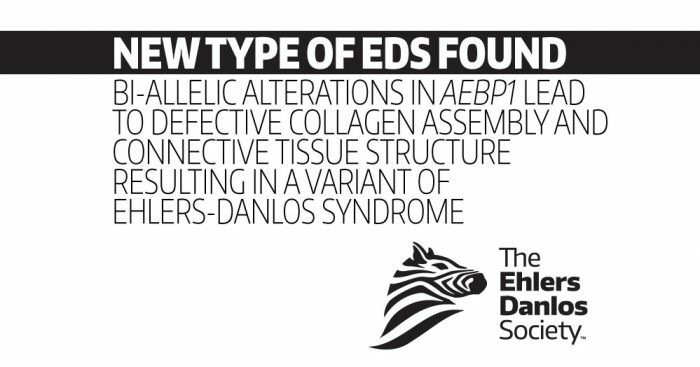 The International Consortium on Ehlers-Danlos Syndromes and Related Disorders has not yet classified and named this type.